Overview The muscle groups of the human limbs are divided into section or compartments. 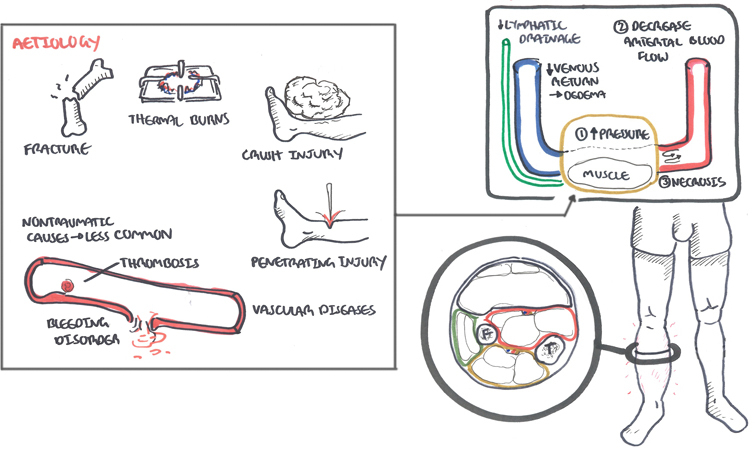 Acute compartment syndrome (ACS) occurs when increased pressure within a compartment compromises circulation and function of tissues within that area. common sites of ACS is the leg and forearm. Chronic (Exertional) compartment syndrome: most commonly occurs in young adult recreational runners, elite athletes, and military recruits. It is caused by increased intracompartmental pressure within a fascial space; however, the mechanism of why pain occurs is unknown. Rhabdomylosis: Medical condition involving the rapid dissolution of damaged or injured skeletal muscle. This disruption of skeletal muscle integrity leads to release of intracellular muscle components, including myoglobin, creatine kinase, lactate dehydrogenase, as well as electrolytes, into the bloodstream. Peripheral Vascular Disease: An atherosclerotic process that causes stenosis and occlusion of non-cerebral and non-coronary arteries. For example plaque in the lower limbs leading to claudication. 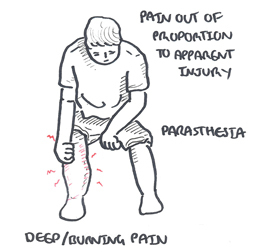 Clinical examination 6P’s: Pain is the most important and can be aggravated on passive stretch of affected compartment (as shown above). Patient with a pulse does not exclude ACS. Pallor is not common because there is still circulation to the area. 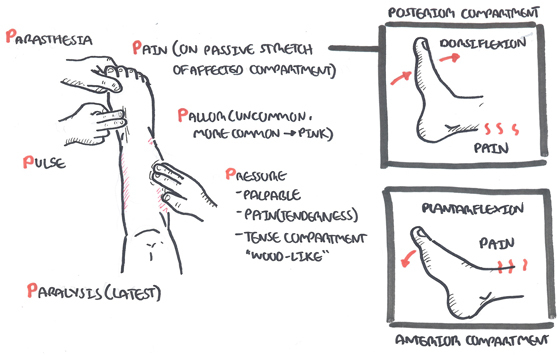 Pressure, on palpation ACS is often described to be wood like, there can be tenderness. Parasthesia is common and paralysis is a late finding. Diagnosis ACS is diagnosed on the basis of history and clinical findings no need for laboratory studies. Investigations that could be performed include FBC, creatinine kinase (CK) levels and urine analysis which in typically show myoglobinuria. 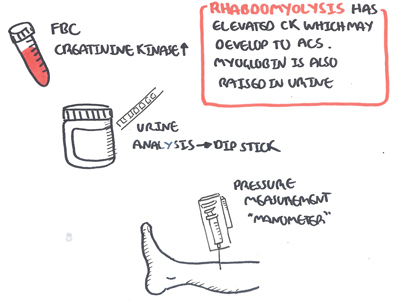 Elevated CK and myoglobinuria is a sign of muscle damage. Further investigation that can help in diagnosis is the measurement of compartment pressure, which can be done with a handheld manometer. 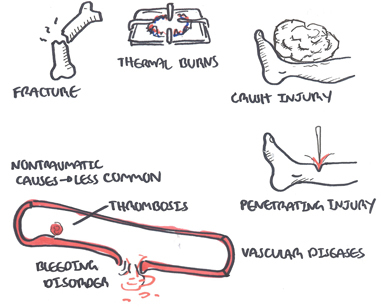 Non-traumatic causes (less common) – ischemia reperfusion injury, thrombosis, bleeding disorders and vascular disease, recreational drugs, nephrotic syndrome. 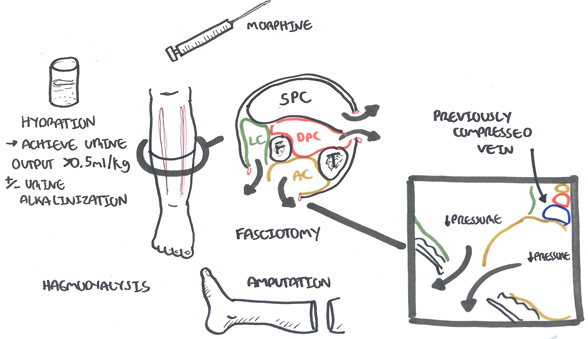 Aetiology Fractures are the major cause of acute compartment syndrome. Do not forget there are also non-traumatic causes including bleeding disorders and vascular diseases. Management Immediate surgical consultation – fasciotomy or not to fasciotomy (conservative therapy). Immediate management of suspected ACS includes relieving all external pressure on the compartment. The limb should be level with the heart (not elevated). Further management include giving analgesia, oxygen, fluids. Surgeons will decide wether to perform a fasciotomy and if the limb is not viable amputation may be necessary.